Long one of the most popular composition readers on the market, The Bedford Reader combines timeless readings with the leading voices of our day. It takes a practical and flexible approach to the rhetorical methods, focusing on their uses in varied writing situations. The unique and newly reimagined "Writers on Writing" feature connects reflections from professional writers with point-of-need advice for student writers, and the Kennedys' class-proven instruction helps students connect critical reading to academic writing. The thirteenth edition has been thoroughly revised with compelling readings, helpful guidance for students on critical reading and writing, and an appendix covering APA documentation and 2016 MLA documentation MLA and APA documentation. 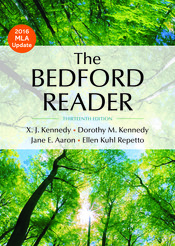 Comprehension quizzes are also available for each reading in the book when The Bedford Reader is packaged with either Writer’s Help or LaunchPad Solo for Readers and Writers.